Sometimes I need massive hits of sugar – so much sweetness that I can finally relax and enjoy myself instead of continually nibbling on tid-bits. That is when I have a sweet lunch. It is really simple. I just make 1/4 or 1/8 of a recipe and eat it as my lunch. Nice no? I have been known to scarf done tubs of ice cream, molten lava chocolate cakes and sometimes even mini microwave cakes on these occasions. Today I was sold on brownies. Specifically these mini delectable s’mores brownies. You guys know what s’mores are right? 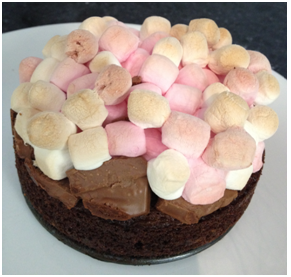 This American idea which consists of two digestive biscuits filled with chocolate and marshmallows before being heated in campfire embers (or the grill/microwave) until the mallow is gooey and the chocolate is flowing. I’d say DAM, these brownies do a good imitation of them. 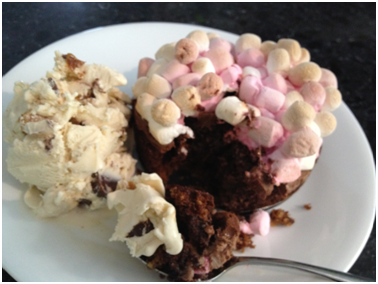 Plus they have a brownie included which makes it all the more better no? So should I make you jealous of my lunch while you healthy normal folk indulged in sandwiches? Yes, yes I think I will. I got the recipe from very talented blogger, Expert Cucina. After a lot of adjusting to increase its s’more-levels, I was finally ready to eat it along with a chunky scoop of Ben & Jerry’s delectable subtle (sarcasm) caramel ice cream, Triple Caramel Chunk – talk about a good Sunday!!! Although this brownie did not grace my brownie categories of best overall brownie (a title still taken up by my Masterchef brownies which I am yet to remake and post about), it did kick the brownie pillow cookies from my ‘Fanciest’ category into the ‘Most Creatively Brilliant’ category which kicked my ultimate caramel brownies into the ‘#1 Brownie With Extra’ category. Nothing like a little decadence at lunch! I think the best part is crushed chocolate chip cookies and the coffee essence-yum! I truly approve of this lunch!!! These look fantastic. Thanks for the add on Foodbuzz! You have some great sweet recipes here! 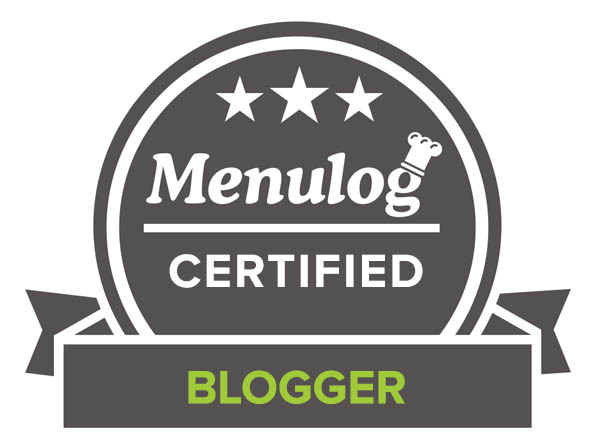 And it is awesome to have another sweet toothed blogger as a foodbuzz friend! So glad you recently stumbled across my blog. It seems like we both share a love for homemade brownies. Mmmmmmmmmmm. So good!!! So it does doesn’t it? I can definitely see myself eating this for lunch! I’ll take these brownies over sandwiches any day. Also, I love s’mores, so what’s not to love? Highly recommended and definitely with ice cream!! !